All animals have to make decisions every day. Where will they live and what will they eat? How will they protect themselves? They often have to make these decisions as a group, too, turning what may seem like a simple choice into a far more nuanced process. So, how do animals know what’s best for their survival? The findings are featured today in the early online edition of the scientific journal Biology Letters, as well as in its Dec. 23 edition. Co-authors Taka Sasaki and Stephen Pratt, both with ASU’s School of Life Sciences, have studied insect collectives, such as ants, for years. Sasaki, a postdoctoral research associate, specializes in adapting psychological theories and experiments that are designed for humans to ants, hoping to understand how the collective decision-making process arises out of individually ignorant ants. 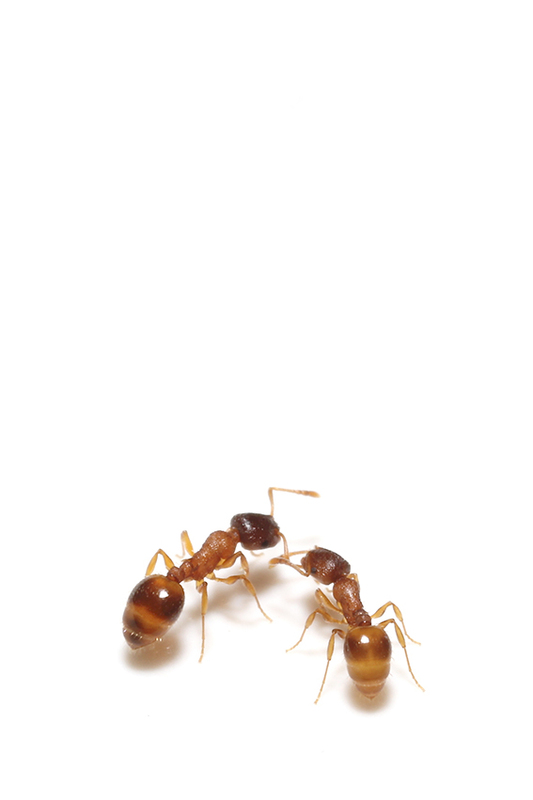 To answer this question, Sasaki and Pratt gave a number of Temnothorax rugatulus ant colonies a series of choices between two nests with differing qualities. In one treatment, the entrances of the nests had varied sizes, and in the other, the exposure to light was manipulated. Since these ants prefer both a smaller entrance size and a lower level of light exposure, they had to prioritize. Pratt continued to explain that because it is impossible to find the perfect habitat, ants make various tradeoffs for certain qualities, ordering them in a queue of most important aspects. But, when faced with a decision between two different homes, the ants displayed a previously unseen level of intelligence. According to their data, the series of choices the ants faced caused them to reprioritize their preferences based on the type of decision they faced. Ants that had to choose a nest based on light level prioritized light level over entrance size in the final choice. On the other hand, ants that had to choose a nest based on entrance size ranked light level lower in the later experiment. This means that, like people, ants take the past into account when weighing options while making a choice. The difference is that ants somehow manage to do this as a colony without any dissent. While this research builds on groundwork previously laid down by Sasaki and Pratt, the newest experiments have already raised more questions. Pratt likened individual ants to individual neurons in the human brain. Both play a key role in the decision-making process, but no one understands how every neuron influences a decision. Sasaki and Pratt hope to delve deeper into the realm of ant behavior so that one day, they can understand how individual ants influence the colony. Their greater goal is to apply what they discover to help society better understand how humanity can make collective decisions with the same ease ants display. The new BioXFEL center will use X-ray lasers to image bioparticles, make molecular movies and help design new drugs. Arizona State University is teaming up with seven other research universities to establish a new Science and Technology Center (STC), sponsored by the National Science Foundation (NSF), with an initial five-year, $25-million grant (extendable for another five years). The center will be based at the University at Buffalo (UB). It is expected to transform the field of structural and dynamic molecular biology, including drug development, by using X-ray lasers to peer into biological molecules. The BioXFEL center will focus on developing a new bio-imaging technique – including an advanced form of X-ray crystallography, called snapshot serial femtosecond nanocrystallography – to analyze a vast array of molecules at which drug molecules can be targeted. This exciting new technique, the focus of several recent papers published in Science and Nature, has shown the potential to spur much needed innovation in the pharmaceutical field because it will provide scientists with new insights into how biological molecules function and what might be happening when disease occurs, and help determine what compounds could modify this activity. Researchers at BioXFEL also will develop “crystallography without crystals,” in which X-ray snapshots (which are so brief that they avoid damaging the samples) can be used to image single viruses and large molecules, which currently cannot be crystallized for conventional crystallography. “The NSF’s Science and Technology Center competition is very intense, with 270 applications this year alone, and few outstanding ideas are chosen nationally for this prestigious award,” said Sethuraman “Panch” Panchanathan, senior vice president for ASU’s Office of Knowledge Enterprise Development. “The award of this center testifies to the world-class research conducted by our exemplary faculty and scientific leaders. It will significantly accelerate this activity and establish Arizona State University as the leader in developing new bio-imaging techniques to address health challenges and improve the quality of life,” Panchanathan said. Eaton Lattman, a professor in the UB Department of Structural Biology in the School of Medicine and Biomedical Sciences and chief executive officer of the Hauptman-Woodward Medical Research Institute, will be director of the new center. John Spence, a Regents’ Professor of Physics at Arizona State University, which has the largest concentration of researchers in the consortium, will serve as the center’s director of science. For ASU’s Spence, the center will open new realms in biological research. Spence said ASU’s contributions to BioXFEL will primarily be in four areas: research in biophysics aimed at improving the techniques of delivering the wet, submicron-sized bioparticles across a pulsed X-ray beam in vacuum (with ASU professors Bruce Doak and Uwe Weierstall of the Department of Physics); application of the method to the molecular mechanisms of photosynthesis (in professor Fromme’s group in the Department of Chemistry and Biochemistry); development of new data analysis methods; and work on the structure of individual viruses (lead by professor Brenda Hogue of the School of Life Sciences and ASU’s Biodesign Institute). UB also will manage the large technology transfer, diversity and education programs, for which professor Carole Greenes at Arizona State University will lead the West Coast component. Labs will be set up to demonstrate the principle of the research for Arizona high school students and undergraduates. The femtosecond nanocrystallography technique could enable researchers to view molecular dynamics at a time-scale never observed before. Spence said the method basically operates by collecting the scattering for the image so quickly that images are obtained before the sample is destroyed by the X-ray beam. By "outrunning" radiation-damage processes in this way, the researchers can record the time-evolution of molecular processes at room temperature, Spence said. “This opens the way to future experiments on laser-excited samples, 3-D image reconstruction and a host of other experiments on fast-imaging, all directed at the grand challenge of obtaining movies showing molecular machines at work,” added Spence. 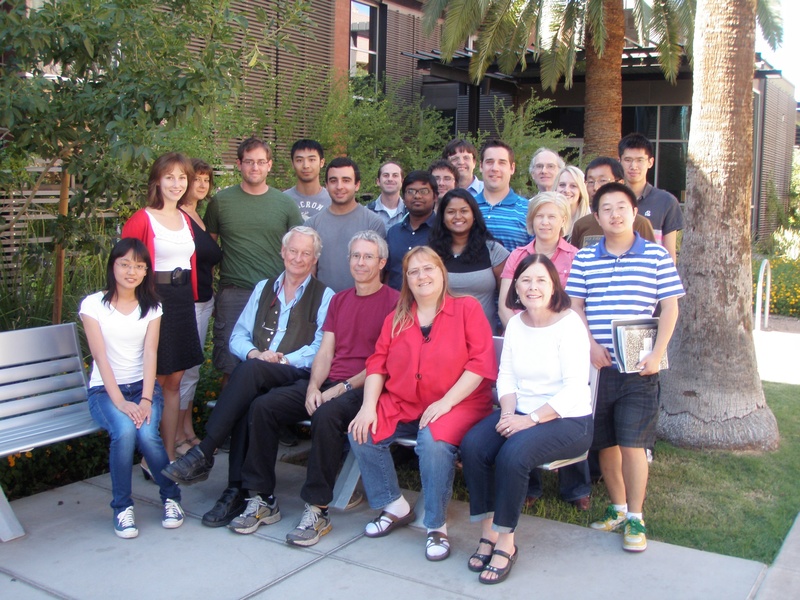 Following the construction of the world's first hard X-ray laser, the LINAC Coherent Light Source (LCLS) at the Stanford Linear Accelerator Center, near Stanford University, the Arizona State University researchers and a group from Hamburg, Germany, led the first biological experiments to demonstrate the technique in 2009. Spence said researchers at the new center will use the X-ray beam at SLAC and will focus on breaking new ground in biological molecular analysis. “We are enormously excited about the opportunity, which the recent invention of the pulsed hard X-ray laser gives us, to make movies of molecules in action and to image molecular reactions in solution as they happen,” said Spence. “We are extremely fortunate to be one of only three centers supported from a pool of hundreds of applicants,” he added. Other partner institutions are the University of Wisconsin at Milwaukee, Cornell University, Rice University, the University of California at San Francisco and Stanford University. The University of California at Davis also will help with creating and managing the educational program.